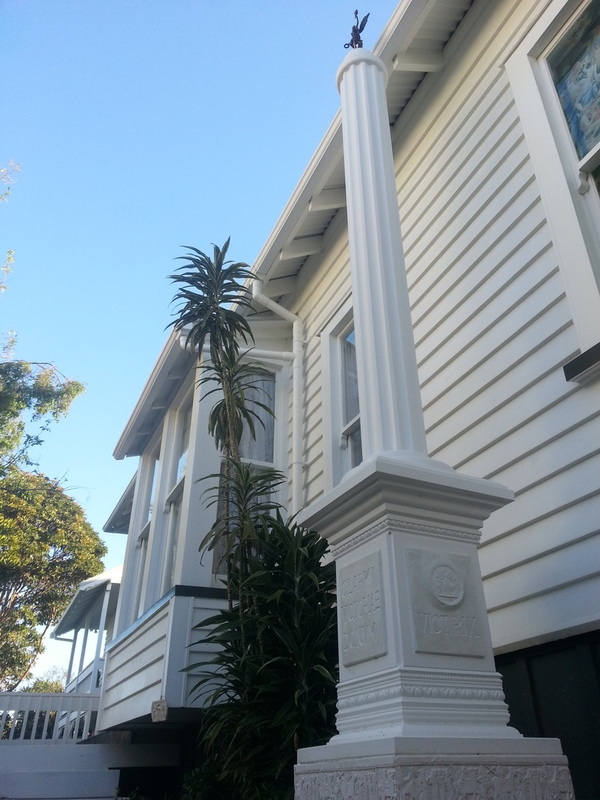 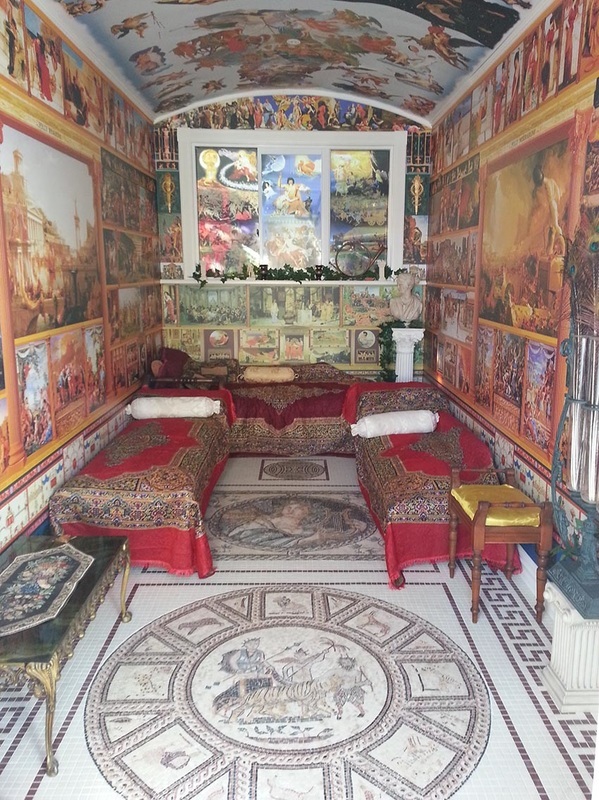 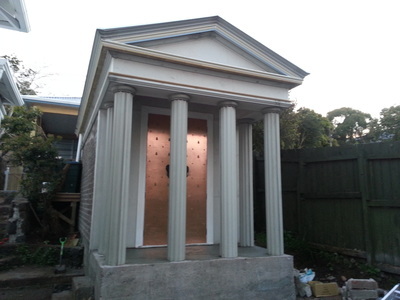 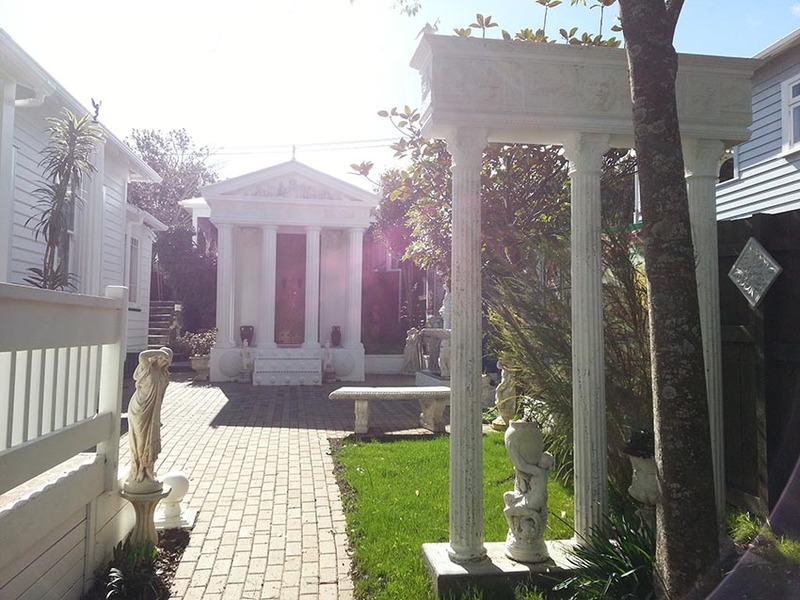 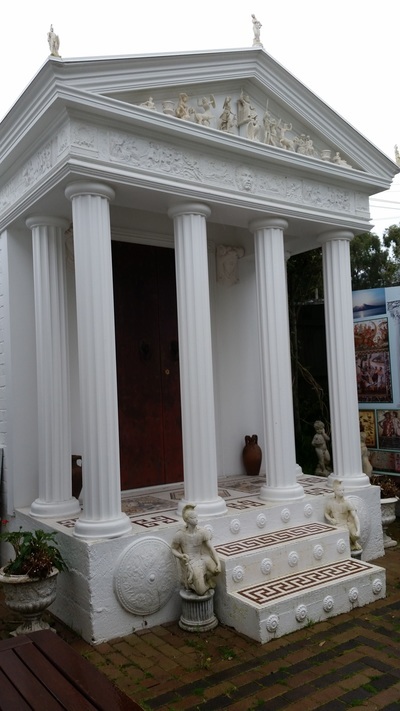 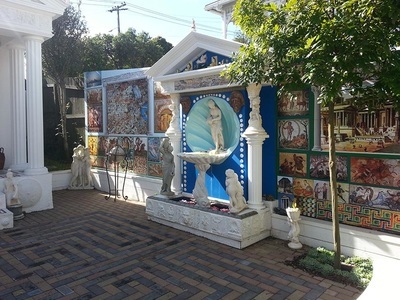 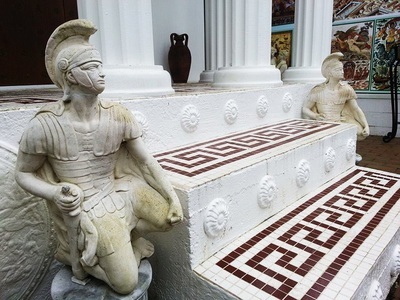 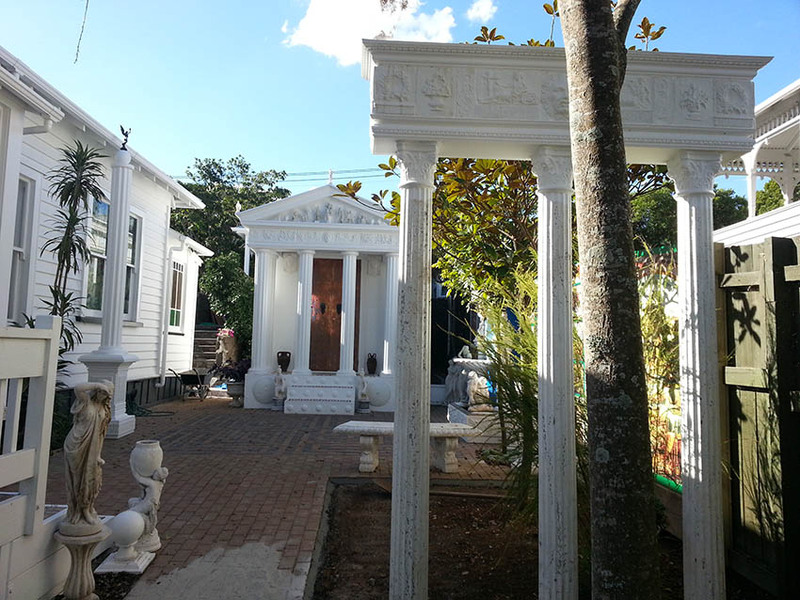 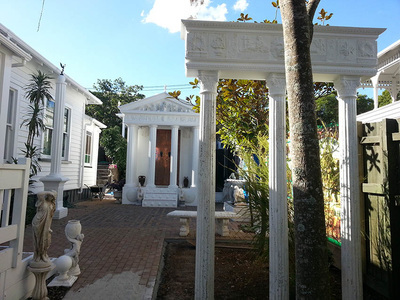 The club often meets up for events at our full-sized Roman Temple at 33 Carlton Gore Road, Grafton, in the center of Auckland, very close to the Domain and the War Memorial Museum. We have Roman festivals and feasts, photo-shoots and it makes a nice central meeting place before heading off to various club events together. 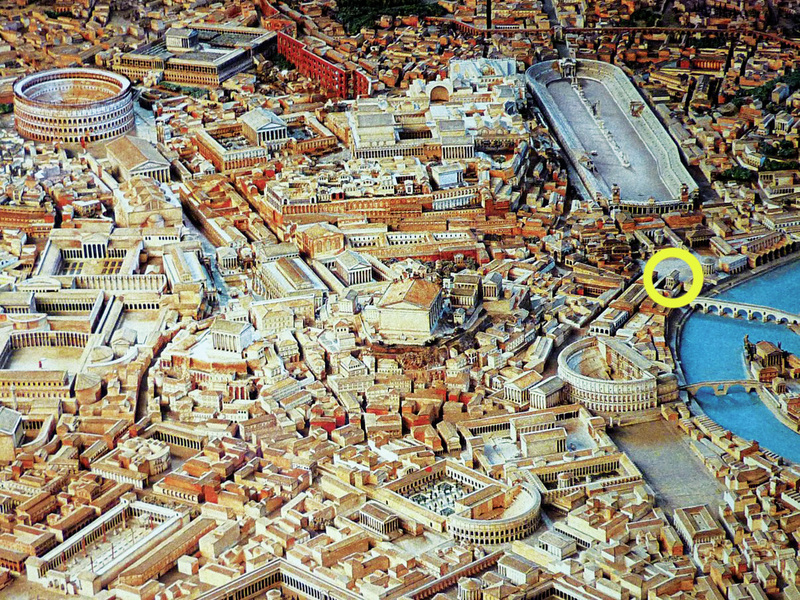 Much club gear is also stored here, including the parade shields, pilum javelins and the scorpion ballista. If you are interested, it is open to view for members of the public by appointment. 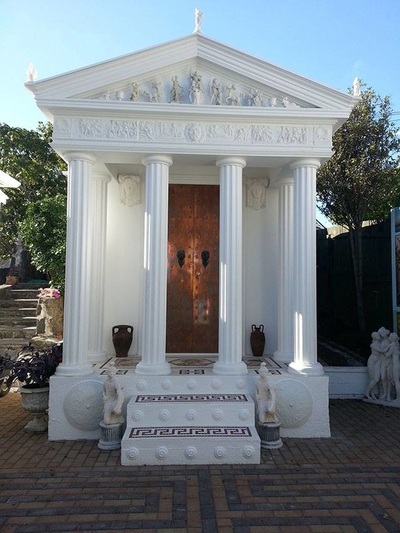 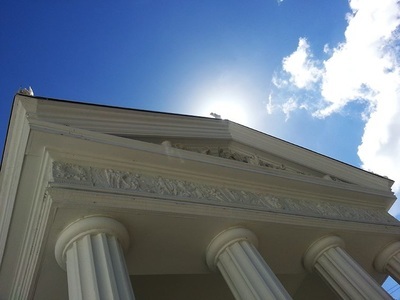 ​The English Enlightenment of the 1700s and the Renaissance (Rebirth, or rediscovery, of classical Roman and Greek culture) made it popular to decorate English gardens with classical monuments known as Follies, and so our Roman Temple is a Folly built in the same spirit. 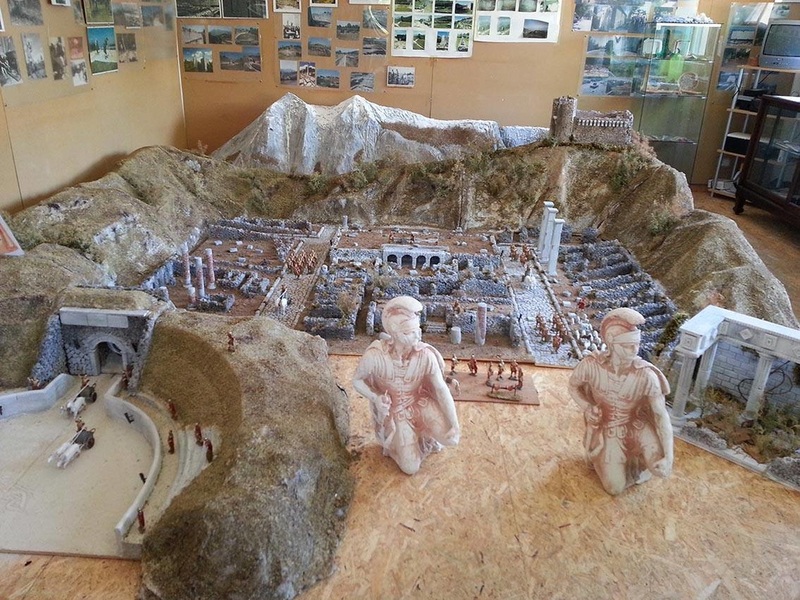 It is based on the oldest Republican temple in Rome, the Temple of Portunus (the god of ports) built around 120 BC, still standing today in the Forum Boarium by the Tiber River in the position as circled on the Map of Rome below. 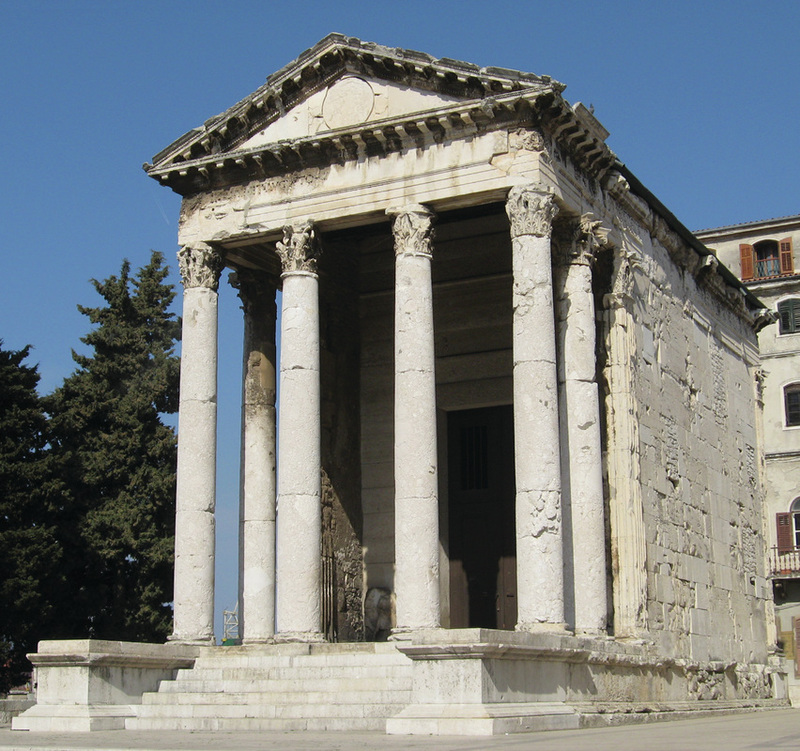 There is also a surviving four-pillar Temple of Augustus in Pula, Croatia. Follies were usually dedicated to some Roman god, such as Apollo, Virtue, Friendship or Honour. 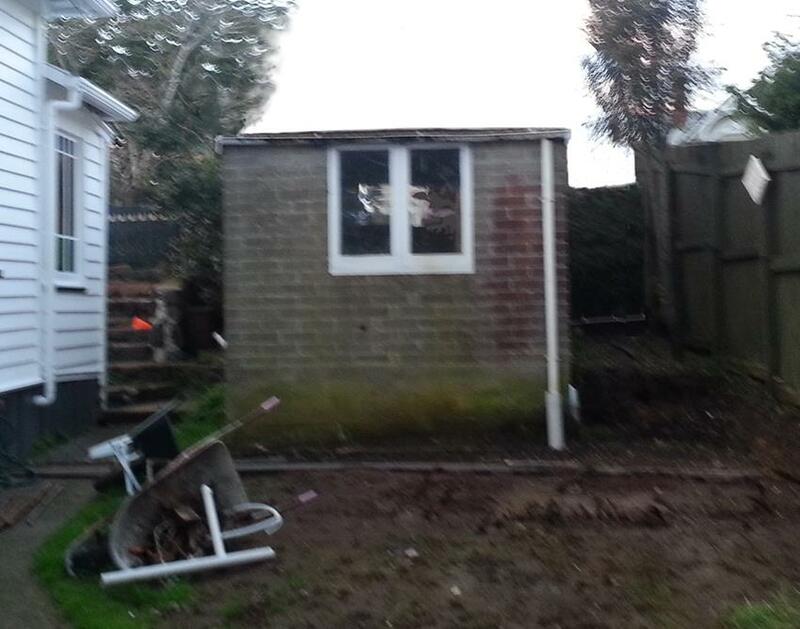 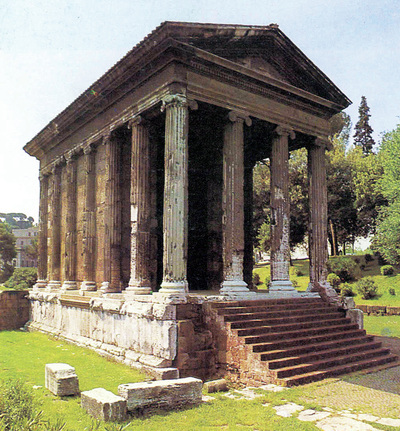 Erasmus' book In Praise of Folly notes that "nobody has ever been fool enough to build a Temple in honour of Folly" and so we thought it about time that some fool did, as a folly to Folly. 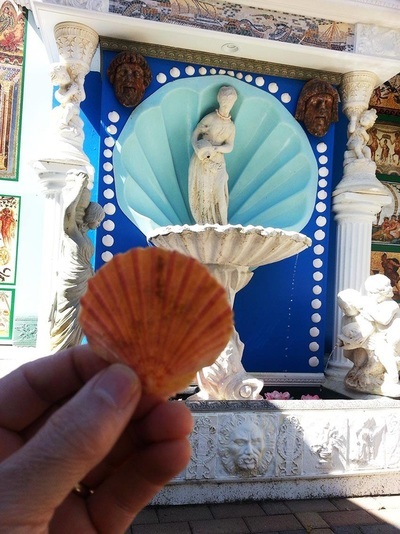 What do we know about the goddess Folly? 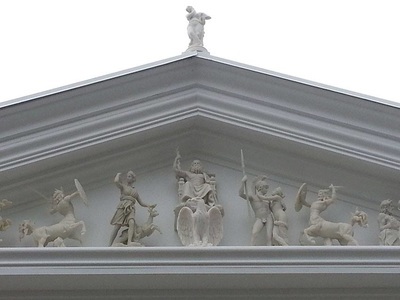 Homer's Iliad says that Zeus tossed her out of Heaven because he was sick of her making him do so many stupid things. 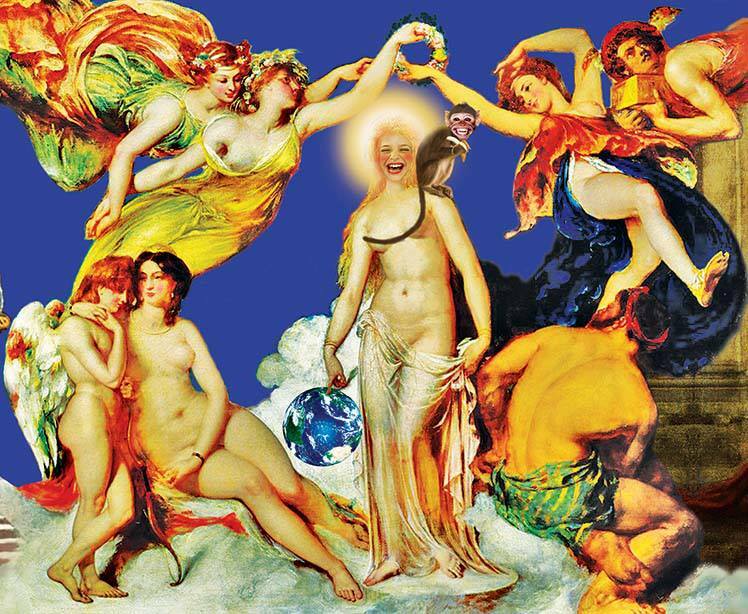 But she never hit the ground, and instead walks on the heads of men. 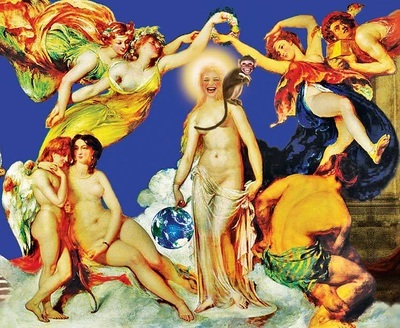 People pray not to do foolish things, but swift Folly can outrun their prayers. 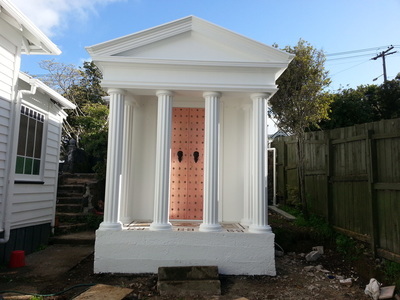 Folly claimed that she didn't need a temple, because the whole world is her domain, so we are providing a public service by keeping her locked up as much as we can. 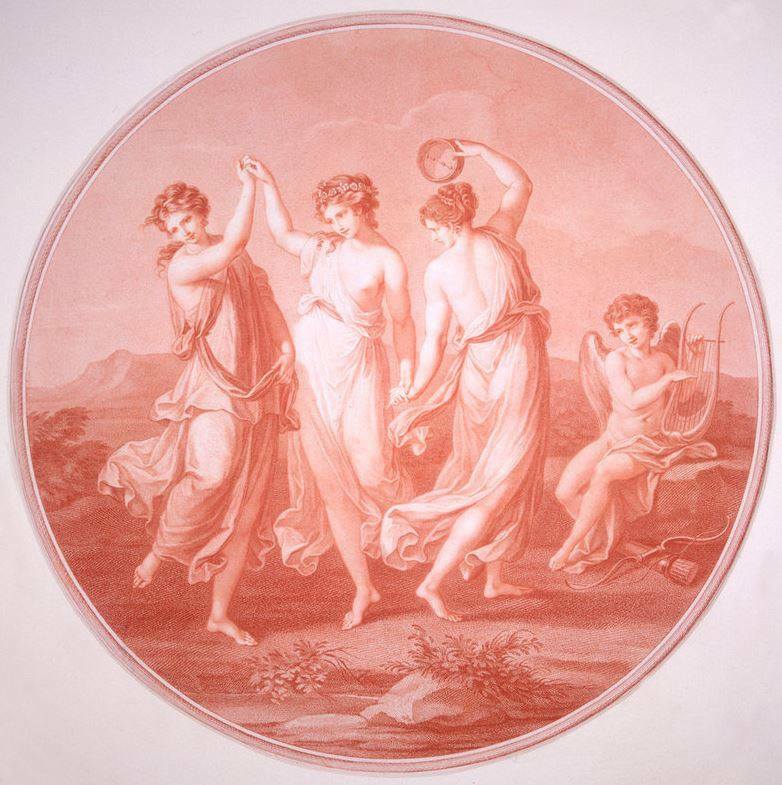 The Greeks called Folly as Até (goddess of mischief, delusion and folly). Até can also refer to the action performed by the hero, usually because of hubris, that often leads to their death or downfall. This is probably why belly-achers say "I think I Ate too much!" Every Roman god has a sacred animal, so we gave Folly the cheeky monkey ready to see you slip over on a banana skin. 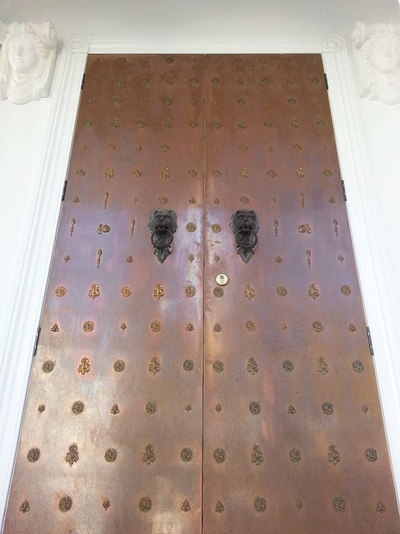 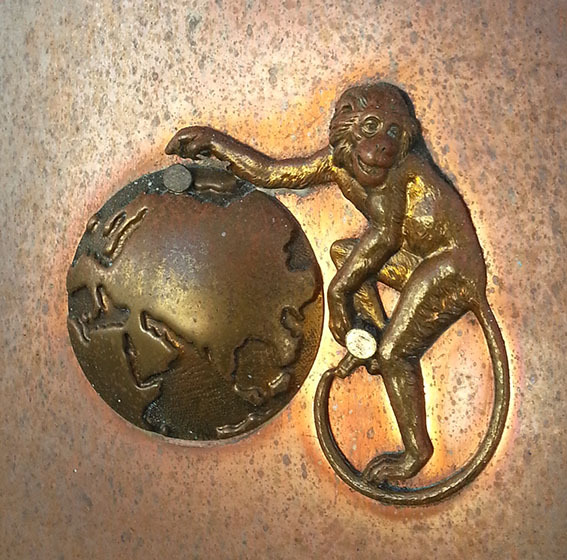 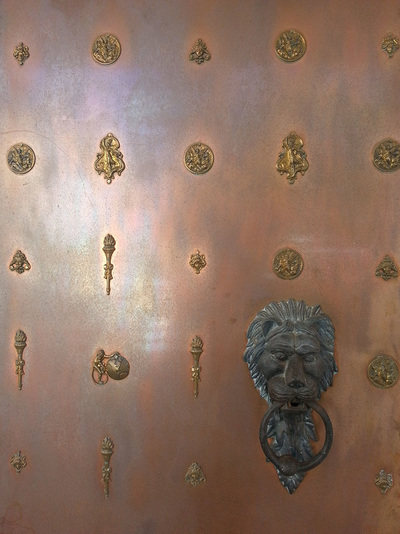 The doors are of copper and bronze decorated with Roman motifs including Folly's monkey embracing the world. 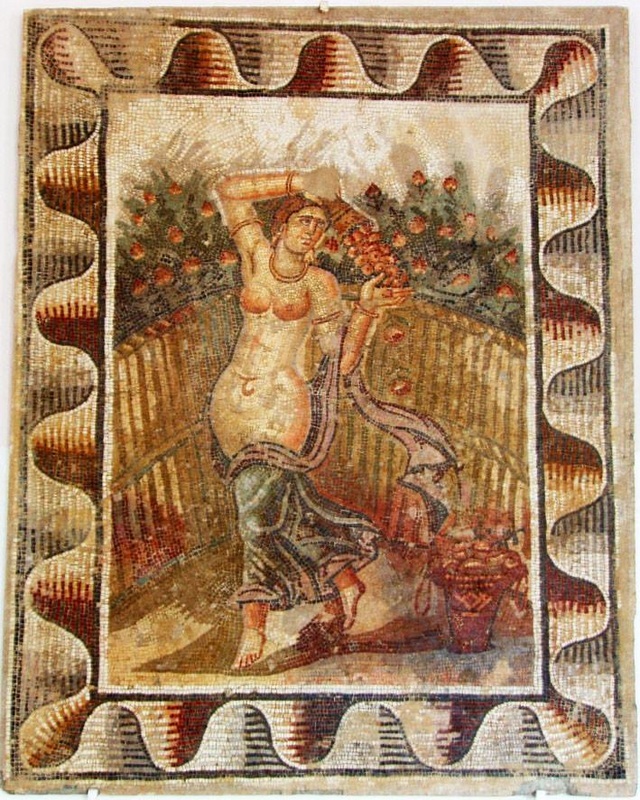 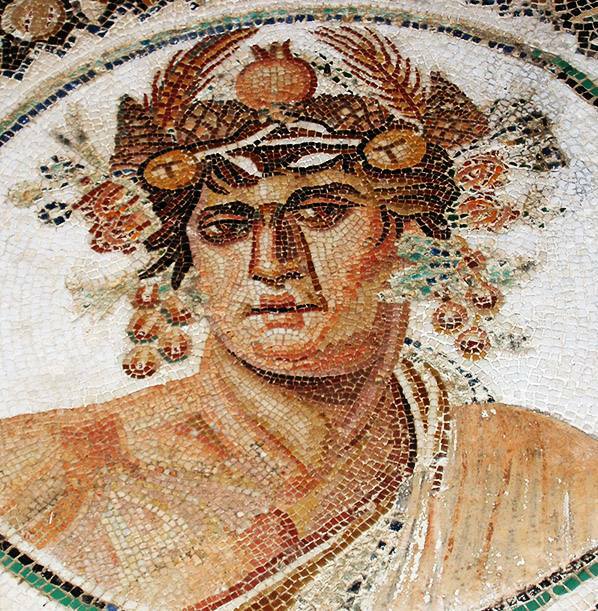 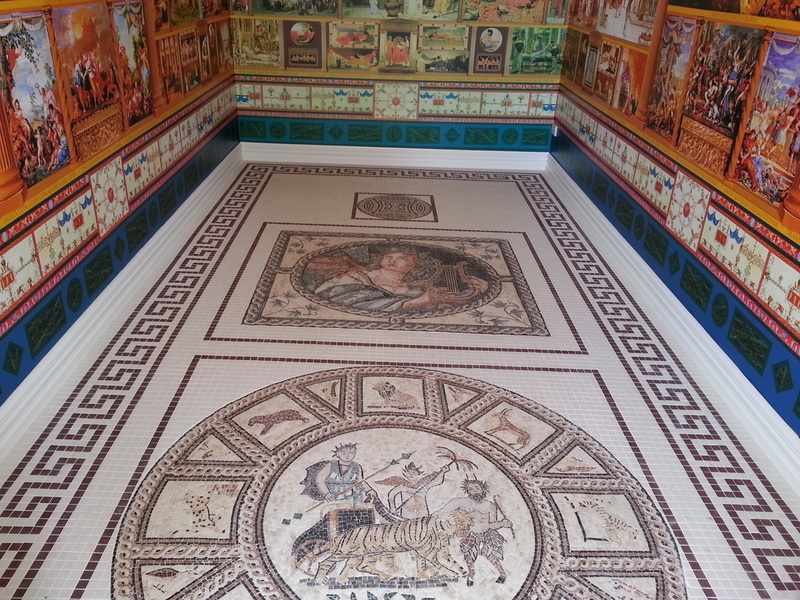 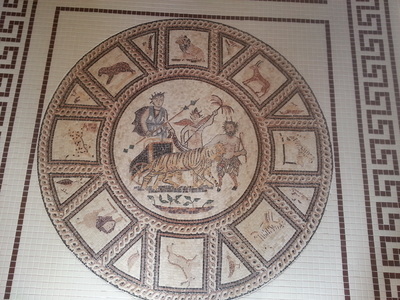 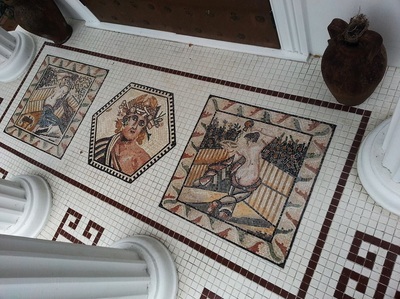 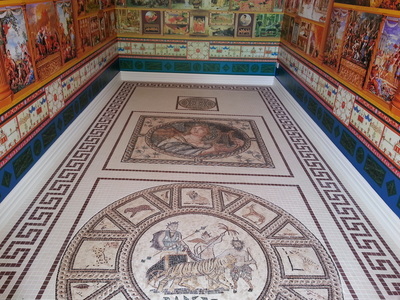 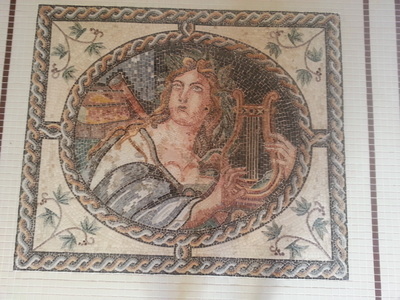 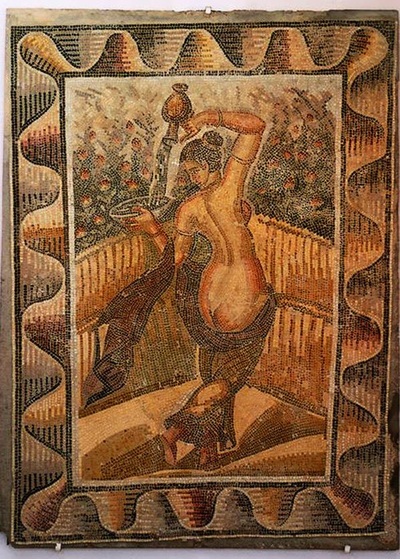 The Roman floor mosaics were made in Lebanon, and show the Triumph of Dionysus (Sarsina, Italy), and either Apollo, Orpheus, or Sappho playing their lyre (difficult to decide). 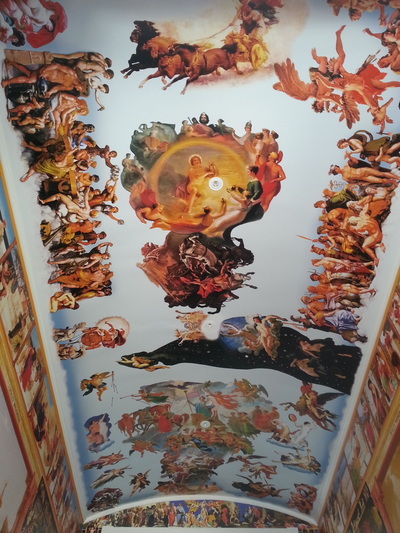 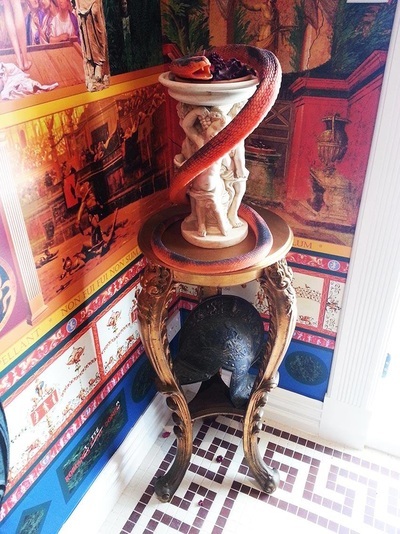 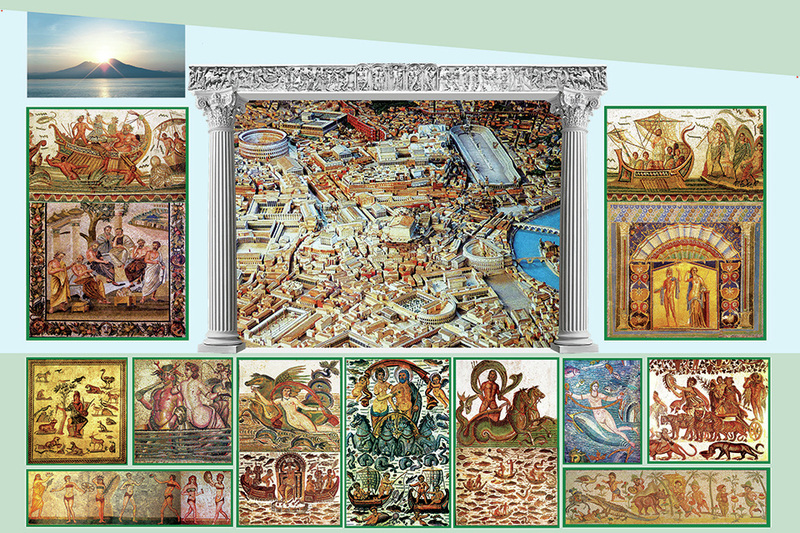 The walls and curved ceiling are decorated with neoclassical art on Roman and mythological subjects arranged in the Roman fresco style. The central courtyard paving is a copy of the Greek labyrinth maze design that usually shows Theseus slaying the Minotaur at the centre. 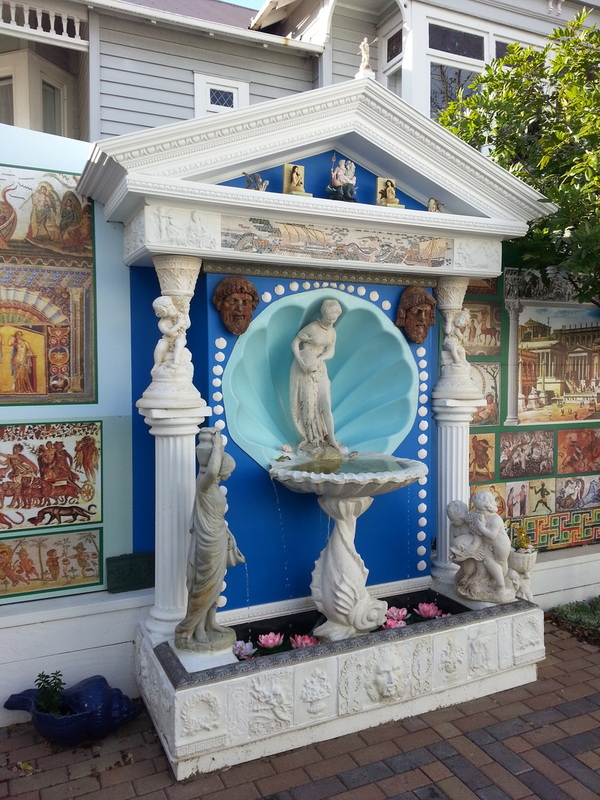 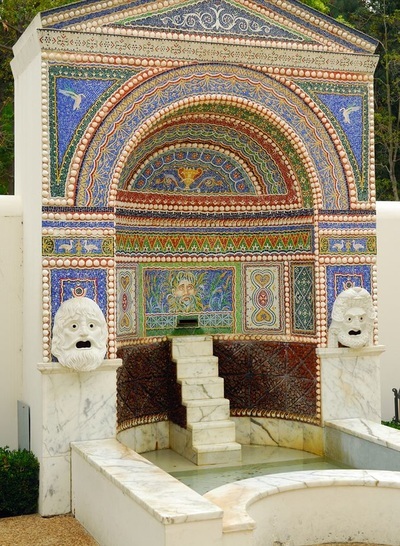 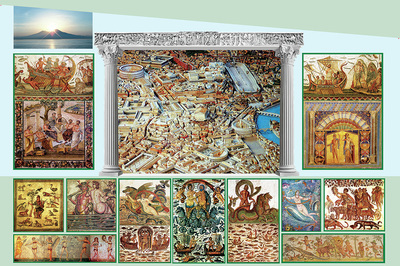 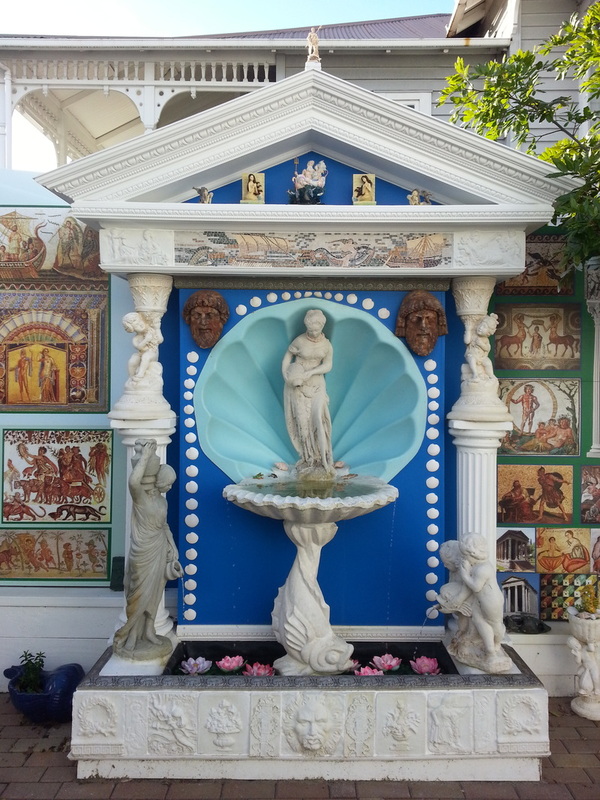 The Roman fountain was inspired by those of ancient Pompeii intense decoration of aquatic motifs and variety of mosaics. 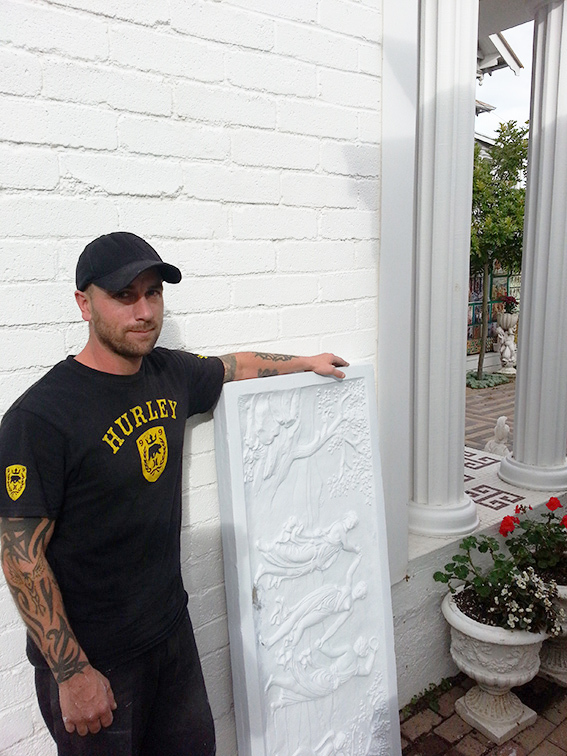 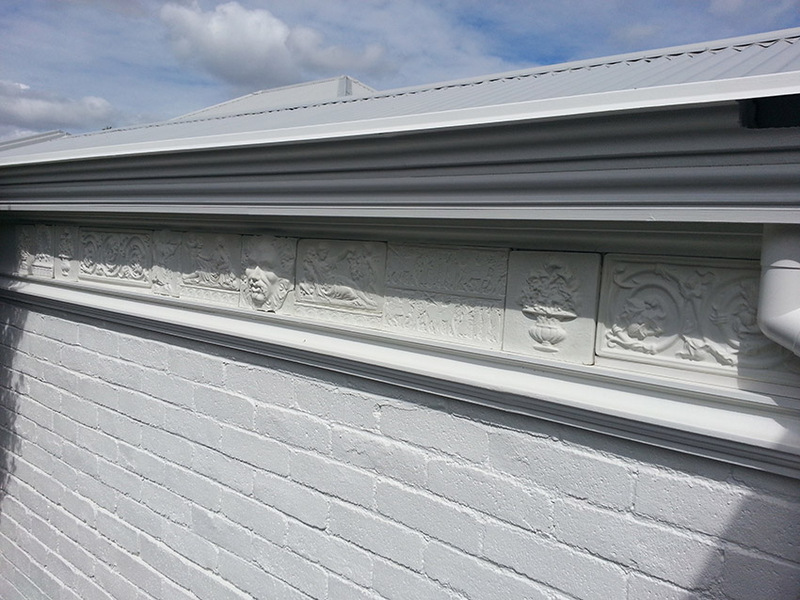 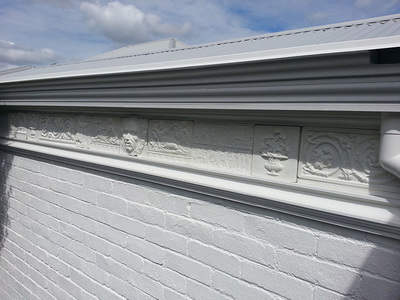 The exterior frieze of cast plaster panel scenes. 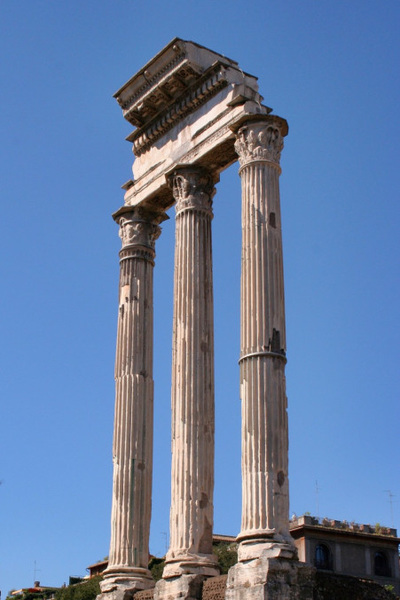 The three-pillars are inspired by the Roman Forum's remains of the Temple of Castor and Pollux. 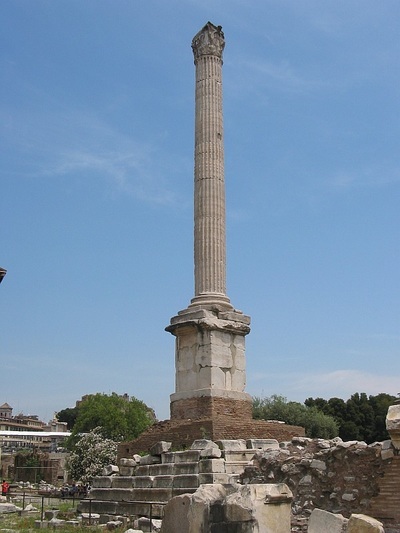 The pillar with Victory on top is inspired by the solitary Pillar of Phocas, the last monument erected in the Roman Forum 608 AD, that honours the Eastern emperor for donating the Pantheon to the Pope to use as a church (the reason that it survived). 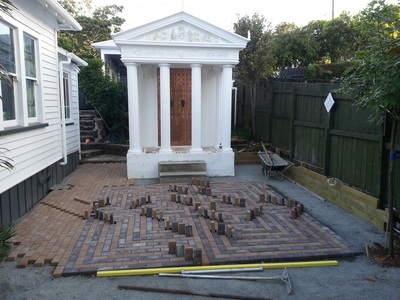 Some of the construction process and laying of the Greek labyrinth paving design.